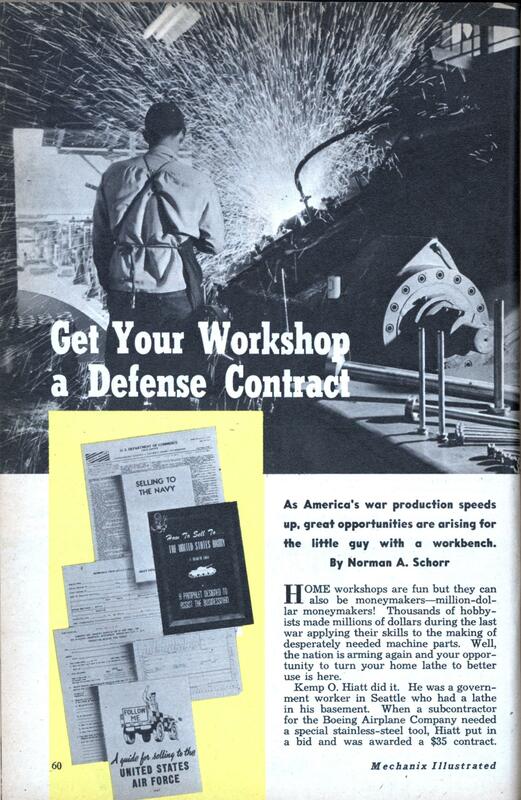 As America’s war production speeds up, great opportunities are arising for the little guy with a workbench. HOME workshops are fun but they can also be moneymakers—million-dollar moneymakers! Thousands of hobbyists made millions of dollars during the last war applying their skills to the making of desperately needed machine parts. Well, the nation is arming again and your opportunity to turn your home lathe to better use is here. Kemp O. Hiatt did it. He was a government worker in Seattle who had a lathe in his basement. When a subcontractor for the Boeing Airplane Company needed a special stainless-steel tool, Hiatt put in a bid and was awarded a $35 contract. Upon completion of this small job he was asked if he’d like to tackle some-more work. Did he! Soon orders began to flow in for increasing quantities of rivet dies, small assemblies and tools. For two and a half years he worked in the basement, adding equipment, employees, contracts—and trouble. Once he nearly was forced out of business because he was operating in a residential zone. Manpower problems frequently plagued him. At one time his key personnel included four school teachers, two preachers, four bankers and an undertaker. But Hiatt and his Ravenna Metal Products Corporation weathered this storm as they did many others. He added to his machining operations the manufacture of a single-handle water mixing faucet and in the 24,000 square foot plant he occupies now, the original lathe has been joined by 95 other major pieces of equipment. He employs 125 men and women, doing work for the aircraft companies, the Army, Navy and atomic-energy program. Some of these contracts have been as large as $200,000. For a business that started with a $35 sub-subcontract and a lathe, that’s not too bad. There are many others about whom similar success stories could be told. But how about the situation today? Is it pos- sible for the man with a small shop to break into defense work now? The answer is yes. It’s tougher, much tougher—but it certainly can be done. Why is it tougher? First, because standards are more rigid. For example, in the aircraft industry which is receiving the lion’s share of defense contracts, requirements have become much more exacting. Precision-made parts have replaced many of the fabricated sheet-metal parts used on previous slow-moving planes. Heavier gauges of metal are being used. In addition, there’s a new, harder aluminum alloy, 75S, now in widespread use, that requires forming and heat-treating not needed before. And, tolerance in the order of five ten-thousandths of an inch are called for. So, aircraft work is no snap. The second and perhaps most important reason that defense contracts are more difficult to obtain right now is that there are more bidders than contracts. So, would-be defense contractors must be prepared for loads of competition. But just because you’re a small businessman doesn’t rule you out by any means. Look at the case of 27-year-old Eli Levine of Detroit. Eli is an ex-corporal who started a one-man shop in December, 1949, making universal joints. It wasn’t Jong before he had a partner and two girl employes. When he learned that the Army Ordnance Automotive Center needed needle rollers to repair transmissions, he submitted a bid. His garage shop was inspected by an ordnance field examiner. Then Levine just waited. Came the day the bids were opened and there were only two. One from a multi-billion dollar corporation, one of the auto industry’s Big Three, and the other from Levine’s fledgling Torque Manufacturing Company! But, believe it or not, his bid was lower and he was awarded the contract. So, you can see that there are jobs for the small shops. This is particularly true in subcontracting. Reports from key production areas indicate that the biggest demand is for precision machining, forging, casting, screw machine work, grinding and gear-cutting. Prime contracts are just about beyond the reach of any but the real large plants. But subcontracting is good business, too. Thirty-one-year-old Risden Curry, of Ann Arbor, Michigan, believes that. He’s building a business on subcontracts. Curry is a former University of Michigan engineering student who now is a toolmaker at the Kaiser-Frazer plant at Willow Run. But that’s only during the day. Nights and week-ends he’s the proprietor of a non-ferrous foundry, set up about four years ago in a 20 by 20 garage with his life’s savings. Business was slow for Curry for quite a while. Then, he sent a simple letter to large manufacturers in the area, describing his facilities and outlining the work he could handle. The letter did the trick. It produced several defense and non-defense subcontracts, and now Curry reports that business is “too good.” At present he’s building up an inventory. Then he’ll quit his job to devote himself full-time to the up-and-coming enterprise. So, after a shaky start, the Curry foundry appears to have a bright future. If you’re interested in landing defense contracts, follow Risden Curry’s example. Concentrate on subcontracts by contacting prime contractors in your area. But don’t just go and say, “I would like some defense work.” That won’t work. Instead, be specific. Describe your shop, your machines and tools, the kind and size of materials you can handle, your experience, your resources and references. Writing a sales letter with these facts is an excellent idea. You might even include some photographs of your shop. And remember that obtaining subcontracts is a selling job. You’ll, find that companies will ask you to register with them, so they’ll be able to contact you when they need your kind of work. Here’s how a prospective subcontractor goes about getting an assignment from the Ford Aircraft Engine Division in Chicago. First, he sees one of the buyers and describes his facilities. Then he looks over the display of engine parts needed. If it appears that he can *” do the job, a company purchasing representative inspects his plant. After that, the contract is negotiated. Concentrate on plants in your own area as much as you can. Prime contractors prefer to parcel work to nearby plants, because it makes it easier for them to inspect the work and to receive deliveries from the “sub.” Successful cooperation generally demands frequent visits between the two parties involved. Another excellent way to scout subcontracting possibilities is to follow the Department of Commerce’s weekly Consolidated Synopsis of Contract Awards. This lists contracts in excess of $25,000 awarded by 55 procurement agencies and gives the names and locations of the prime contractors with a brief description of the items ordered. Although classified, development and certain other contracts are omitted, it’s an excellent prospect list for subcontracting. The U.S. Department of Commerce also issues a daily announcement of prime contract requirements of the military. Both of these lists are available at the • Department’s 42 field offices and 6,000 cooperating outlets throughout the country, including banks, chambers of commerce, public utilities and trade associations. If there’s any question about it, write to the Chief, Small Business Division, Office of Domestic Commerce, U. S. Department of Commerce, Washington, D. C.
Also, check your state’s department of commerce to see if it is aiding defense contractors. For example, if you’re in New York state, take advantage of the commerce department’s efforts to dig up defense contracts for firms in the state. Be sure you’re registered in the State Industrial Preparedness Survey, which covers the metal working, wood working, plastics, paper and textile industries. New York state makes available information on specific military needs, also locates potential subcontractors, for “primes.” During two recent months, 234 small plants were located for specific subcontracting jobs. Other states are performing the same kind of service, so don’t overlook this possibility. Many chambers of commerce and similar groups serve as clearing houses for prime contractors looking for “subs” and vice versa. A leader in this work is the Commerce and Industry Association of New York City, whose efforts have resulted in negotiation of many millions of dollars of contracts. Another way to open the door to defense work is to develop something new, figure out a way to save material or a better way of making something. That’s the way the Tubing Seal Cap Company of Los Angeles got started. It was in 1940 that Richard L. Ames solved a big headache for airplane makers by devising a steel cap and plug to be placed on the ends of tubing assemblies for hydraulic controls. Assemblies fell apart before that. Ames and two associates received orders from all the big aircraft manufacturers for these gadgets and their business grew till now it employs 125 and has just moved into a new, larger plant. It still makes civilian goods where the metal is available, but is back doing a considerable amount of defense work. More recently, Gordon Murphy of Springfield, Mass., entered the field by the same technique. He had always played around at home with welding equipment, a lathe and some tools. About five years ago, when he was a welder at Pratt & Whitney, the company’s experimental department was attempting to design an instrument called a probe. Resembling a surgeon’s tool, this probe was to be used as part of a temperature-measuring device inside a jet engine. It required welding of alloys which would not fuse easily and which could withstand great heat. “We hadn’t licked this job,” Gordon recalls, “and one Saturday afternoon at home I went to work and made one. I took it to the shop on Monday and it worked.” And so, the Springfield Instrument Company was born in the garage workshop behind Murphy’s father’s home. Murphy worked alone for a couple of months with his father helping nights and Sundays. Then he hired a man and the business was off the ground. Today, the lathes, drills, welding outfits and 15 employes leave no room in the garage for cars. But that doesn’t worry Murphy—he’s too busy hunting new customers. Still another recommended formula for success in defense work is to join forces with another specialist in a related field. George Lynch, a toolmaker. and Leslie Julian, an engineer and tool designer, did this about 11 years ago. With about $300 they bought some broken down equipment. While still continuing in their regular jobs at an aircraft plant, they put their machines into running condition in a Forestville, Conn., garage. Then, they went out after business. Today, their Bristol Machine Tool Company occupies a two-story building where they have 20 to 30 designers and engineers and 60 machinists, toolmakers and machine operators at work. They make and design machine parts, jigs and fixtures. So, joining forces really paid off for Lynch and Julian. In Glendale, Calif., Fidel Danieli did it another way. He trained his wife, Tempi, a former school teacher, to turn out taps and lead screws. Now the Danielis work side by side on military contracts for North American Aviation. In different parts of the country, a World War II method of obtaining military contracts for small firms is showing signs of life again. This scheme involved the formation of a pool, in which a group of shops banded together to sell their diversified skills and facilities. Many of them were highly successful. Government agencies and prime contractors were more willing to award contracts to a group that would take the responsibility for making an entire product, or larger runs. The pool was awarded the contract, then parceled out the work among the members. Although many leading procurement people today say that pools aren’t necessary yet, efforts to reactivate them are underway in several cities in northern California and other places. There will undoubtedly be more. Perhaps such a plan might be practical for your community. One of the most unusual of all the pools was in Cleveland. Called the Victory Pool No. 1, it included among 200 member subcontractors about 65 home workshops. Its combined productive capacity was estimated at about $10,000,000 a year. Right now, the government is making a sincere effort to funnel more defense orders to small firms. Small business specialists have been assigned to each armed service procurement office to execute the program. Subcontracting clinics being held by the different agencies are proving quite successful, too. At such events, prime contractors display the products and parts on which they need help. Would-be subcontractors are invited to look around, see what they can make, then discuss it with representatives of the prime contractors. At the Air Force’s first clinic in New York, more than 5,000 small businesses were interviewed by prime contractors. An official statement reported that more than 50 per cent of these would fit into future subcontracting plans. Although the clinic-exhibits cannot turn up work for all who attend, they do provide an excellent meeting ground for “primes” and “subs.” The latest development is the consolidated clinic, representing all the procurement agencies, to be held in many parts of the United States. So ask for them at the nearest procurement office or Department of Commerce field office. General information on doing defense work may be found in three booklets which may be obtained from the Superintendent of Documents, Government Printing Office, Washington 25, D. C. These booklets are: How to Sell to the U. S. Army (30 cents), A Guide for Selling to the U. S. Air Forces (15 cents) and Selling to the Navy (15 cents). These pamphlets list what the military agencies buy, give the addresses of local procurement offices and outline procedures for getting on the mailing lists of the different services. (1)	Watch out for the close tolerances. (2)	Know what you’re talking about—don’t bluff a prime contractor. (3)	Don’t bite off more than you can chew. By following these simple rules, you can make money in defense contracts—even though the competition is keen and the standards high. One of the most fabulous Horatio Alger stories in the field is that of Fred Rohr. Only 11 years ago he gathered five men around him and launched the Rohr Aircraft Corporation in a 20 by 20 foot garage in his backyard. Almost before the crew took off their coats they moved to larger quarters. 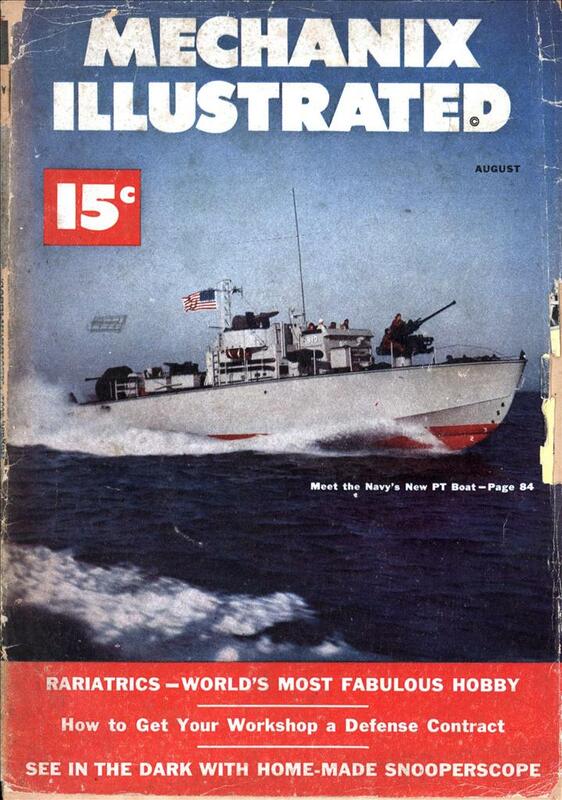 First year sales totalled $1,493,000, jumped to $9,500,000 in 1942 and to $76,000,000 in 1944. Although Rohr developed and made a wide variety of aircraft parts and assemblies, he tackled one of the toughest jobs in the field by specializing in power packages. Today his 3,400-employe company occupies 21 buildings and is recognized as the world’s largest producer of these ready-to-install power packages for airplanes.